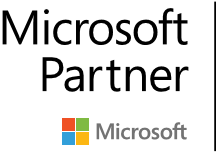 Blue Margin used Power BI to help a CPA firm create a compelling financial story for one of their largest clients, DLP Property Management. The CPA firm looked good, their client looked even better. 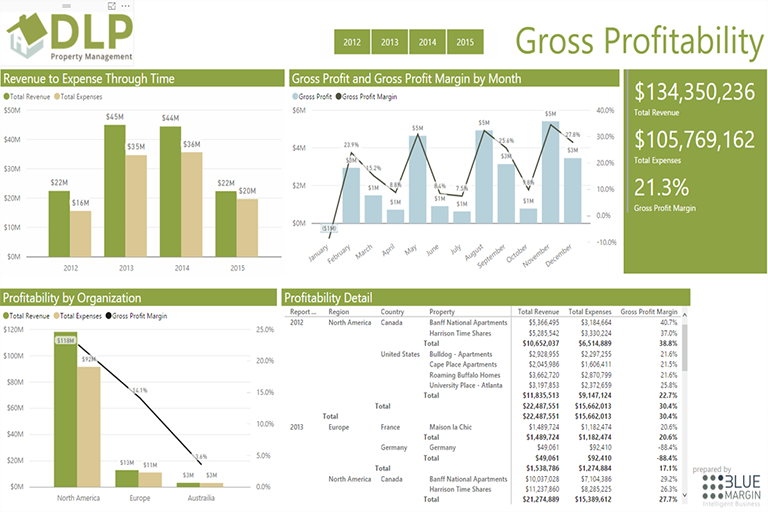 Hearing about Power BI’s powerful functionality, and Blue Margin’s knack for creating dashboards that actually drive decisions, a leading CPA firm asked Blue Margin to come up with a BI solution for one of their largest clients, DLP Property Management. DLP Property Management (DLP) has rental properties in the United States, Canada, Europe, and Australia. Managing financial details for each property was burdensome and left DLP executives feeling devoid of “the big picture”. DLP had over 2.5 million rows of detailed, tabular data, and managers lacked the ability to easily drill down to assess each property’s financial performance. 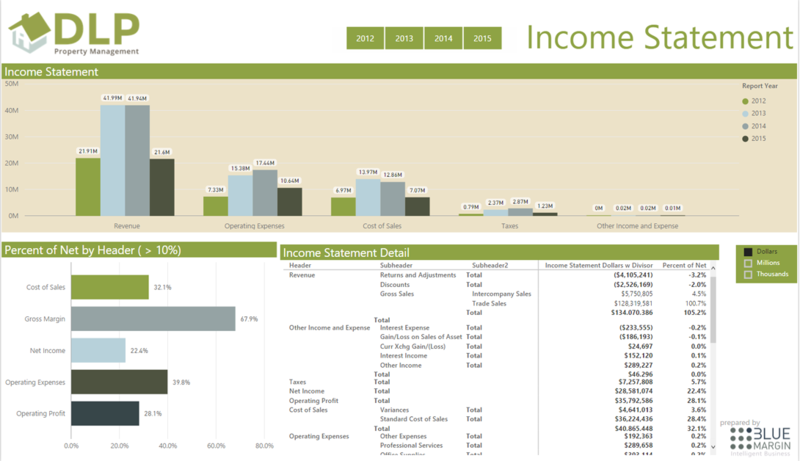 • How do the income statements compare to one another, year over year? • How does gross profit versus gross profit margin figures compare for properties in the United States versus Canada, over time? • Which European property had the most favorable ratio of revenues to expenses? In addition, DLP required better information to make critical investment and expansion decisions, such as which country is best for expansion opportunities, and which country has the greatest profitability by organization. They needed to know if it was wise to expand. Realizing their frustration, DLP’s CPA firm wanted to provide a solution. At a Power BI talk given by Blue Margin, the CPA firm had learned about Power BI’s functionality, and wanted to offer it to DLP as a service. 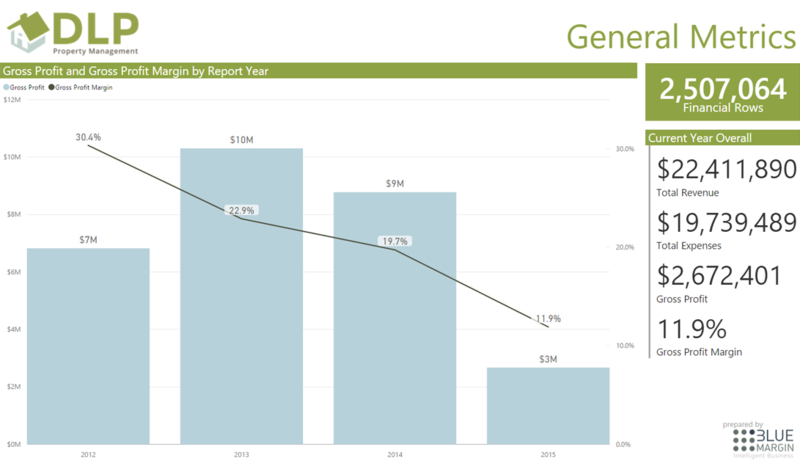 Blue Margin used Power BI to invigorate once static income statements, giving managers insights and the ability to explore the data in order to make critical financial decisions. • Drill down to each level of a property’s income statement and make comparisons over time. • Determine variances in Cost of Sales and other metrics. • Determine which region is ripe for expansion and which may be hurting the company financially. In this case, the value Power BI provided is two-fold. The executives at DLP benefited from new strategic insights. The CPA firm was able to deliver to DLP a powerful solution, increasing their value to the client. Using Power BI, Blue Margin transformed DLP’s data into a strategic asset, empowering managers and the accounting team to make informed decisions about each property.